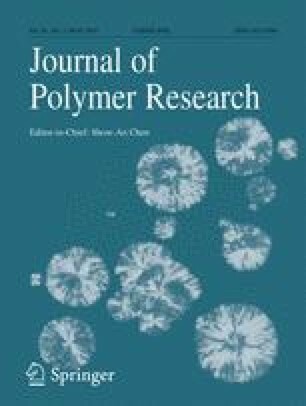 Two thiophene- and pyrene-based conjugated microporous polymers poly[1,3,6,8-tetra(2-thiophenyl)pyrene] and poly[1,3,6,8-tetra(3-thiophenyl)pyrene] (PTThP-2 and PTThP-3) were designed and prepared through a FeCl3 oxidative coupling polymerization. The PTThP-2 and PTThP-3 possess considerable BET surface area of over 370.8 m2 g−1 and 748.2 m2 g−1, large pore volume of 0.544 cm3 g−1 and 0.573 cm3 g−1, good stability, and display excellent guest uptake of 1.62 and 2.00 g g−1 in iodine vapour. Furthermore, incorporation of pyrene and thiophene moieties into these polymers can induce high fluorescence in the dispersions of tetrahydrofuran (THF), which make them sensing electron-deficient iodine via fluorescence quenching with the Ksv of 1.99 × 103 and 5.09 × 103 L mol−1, and the limit of detection of 7.54 × 10−8 and 2.95 × 10−8 mol L−1, respectively. The online version of this article ( https://doi.org/10.1007/s10965-019-1766-9) contains supplementary material, which is available to authorized users. This work was supported by Natural Science Foundation of Anhui Education Department (under Grant No. KJ2018A0319) and the open fund of AnHui Province Key Laboratory of Optoelectronic and Magnetism Functional Materials (under Grant No. ZD2017007).